(Oct. 21, 2010) – Students at Katy HS, Morton Ranch HS and Seven Lakes HS met a very special canine named Utsi last week during a presentation from the CHAMPS (CHildren Against Mines Program ) organization. CHAMPS trains dogs to find landmines in mine contaminated countries around the globe. At least five Katy ISD schools are planning to raise $20,000 each to sponsor one dog that could save as many as 10,000 lives. "Every half hour someone falls victim to a landmine," said Kimberly McCasland, CHAMPS director. "Forty percent of landmine victims are under the age of 15." 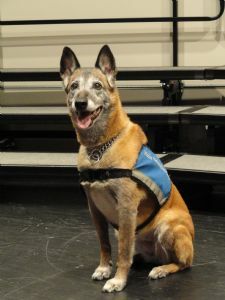 During a presentation at Seven Lakes High School, Utsi, a 10-year-old Belgian Malinois, demonstrated her skills by sniffing-out a mock mine. Utsi is a retired mine detection dog who served more than five years in Africa. She has since retired from active mine detection and now serves as the official CHAMPS Canine Ambassador. Student groups from each participating Katy ISD campus will lead the project by hosting fundraisers throughout the school year. Seven Lakes' Interact Club is leading the mission on their campus, kicking-off fundraising efforts during the week of Oct. 25-29 by selling custom dog tags and bracelets. "This is a school-wide international philanthropic program that involves kids helping kids, while teaching the importance of giving back," said Christie Whitbeck, Seven Lakes HS principal. Added Rose Trevino, ESL teacher at Morton Ranch High School, "We have three student groups working to sponsor a dog: Senior Women, Student Council and National Honor Society. Each group has a different fundraiser planned and, if we cannot raise enough for one dog, we hope to join with other campuses to pool our money." Participating campuses include Katy, Morton Ranch and Seven Lakes High Schools, as well as Beckendorff Junior High and Bonnie Holland Elementary. These students are exemplifying the KatyOne spirit of growing together to create the future.